Many campus ministers work primarily from campus and/or coffee shops, but even if you have your own office, it’s more than likely you spend a lot of time on campus. One frustration with living out of a backpack is the number of devices many of us carry which need charging, and the seeming inaccessibility of power plugs in public spaces. Two years ago I saw this Belkin Mini Surge Protector (affiliate link) on Amazon and had to try it out. It was only $20 and promised me, in a convenient travel package, two USB ports and three power outlets. It’s met my every expectation as a plug splitter and surge protector. However, I’ve found it most useful in public settings where all of the few available outlets are taken (Starbucks and airports come to mind.) While others watch and wait, I simply tap someone on the shoulder who has their laptop plugged in, show them this device, and ask if they would mind me sharing their outlet. No one’s ever said no, and often they ask if they can plug in another device. If you find yourself on the go and in need of a wall outlet (or many), this device has been a lifesaver for me and might be worth your $20. (Staffhacker has an affiliate account with Amazon.com and any purchases made through the above link will go to pay for hosting, promotions, and to pay the writers). 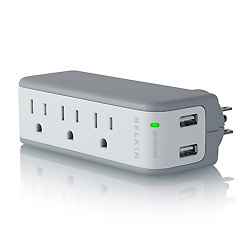 Category: Physical Organization | Tags: belkin, outlets, power, surge protector | Permalink | Post a comment | Trackback URL. Agreed. This is something I never leave home without. This may be the best $20 you can encourage someone to spend.